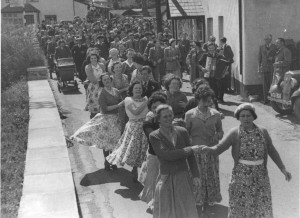 Coronation Celebrations in the village in 1953. Dancing through the streets. 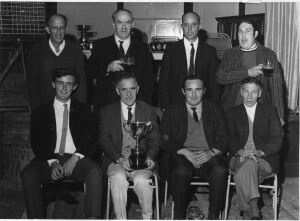 Early leaders in the dance are Thelma Lowry and Mrs Pike, June Bradbury and Mary Salter, Barbara and Les Bowden, Mrs Netherway and Marjory Webber, Barbara Hole and Michael Pike, Mrs Reed followed by a large part of the population of Hemyock.